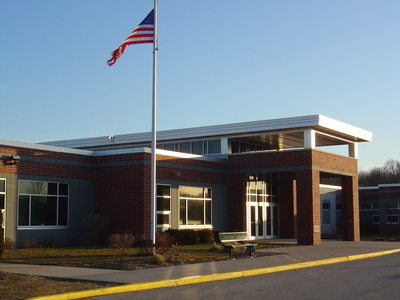 Addison Elementary's front entrance is where parents can drop off and pick up their children. Enter through the main entrance and stop in the office if you wish to visit the building. 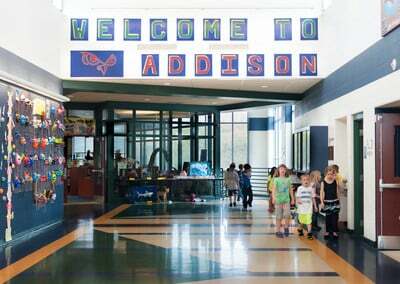 Welcome to Addison Elementary! 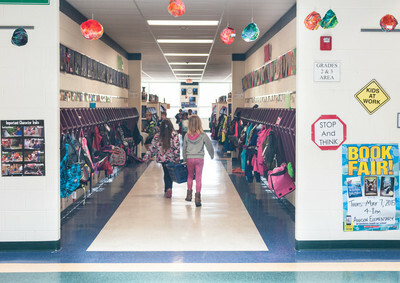 Throughout the building, you will find students learning, sharing their ideas with others, exploring new areas in their educational career, and showcasing their work in the hallways. Make sure to visit us soon! 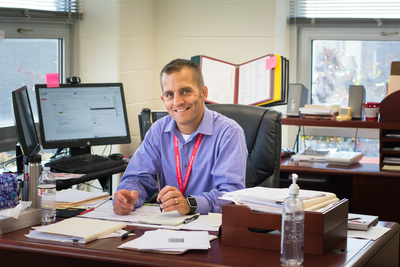 Mr. Dziedzic started at Addison Elementary School as principal in the fall of 2017. He lives in the Slinger Community with his family and has three daughters that attend the Slinger Schools. Mrs. Olson, our school secretary, can answer any and all questions that you may have. She is the first one that greets you as you enter our school and will be the last smile and good-bye that you hear as you exit the building. 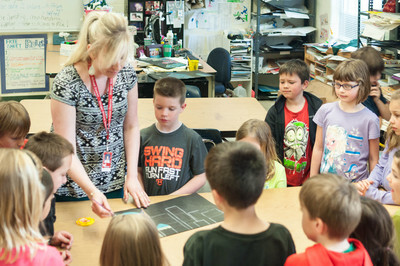 Mrs. Schaefer helps teach our students about important character traits. She also works with our Addion Playwrites, Addison Ambasadors, Character Crew, Supply Junction and the Bubby Bunch. 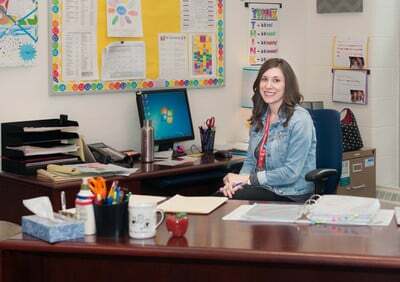 Her office can be found in the school's main office. Mrs. Decker helps to keep Addison's library running smoothly. Your children will visit Mrs. Decker for all their library needs, younger students will listen to stories, as well as check out books. Mrs. Franks works with teachers and students to support literacy learning at Addison. Her classroom is located in the Library. The computer lab is always full of students who are working hard on their technology skills! Continue to explore our website to see what the students are learning and exploring. 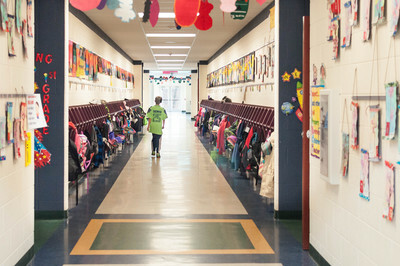 Leaving the main entrance, turn right to take a walk down the First Grade Hallway, where the learning is in full swing! Continue down the hallway to the "Crossroads". 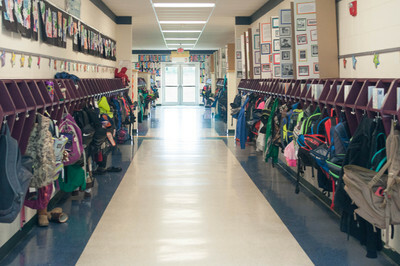 This is where the Second and Third Grade Hallway meets the Fourth and Fifth Grade Hallway. There is always something happening in this area! 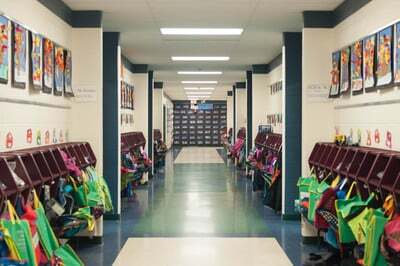 This is where all of the hallways for the grades come together. 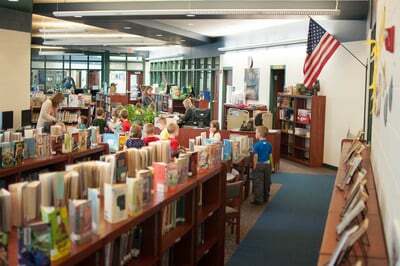 Turn left from the "Crossroads" and you will find the Super Second Graders and Thrilling Third Graders hard at work! These students work hard both in their classrooms and in their break-out areas (a great place for small group work). Turn right from the "Crossroads" and you will enter the Fabulous Fourth and Fifth Grade hallway! The oldest students in our building are working very hard to be the best examples that they can be for all our younger students. 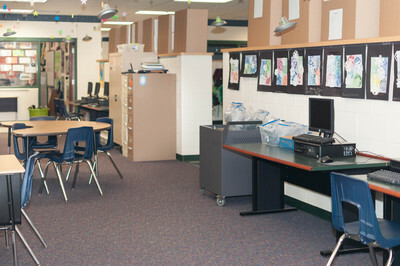 Grades 2 through 5 each have a breakout area that is a great place for small groups or individual to work. Take a walk down the stairs from the main entrance and you will find the cafeteria. 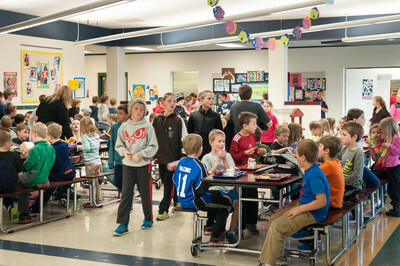 The students enjoy socializing while eating a lunch from home or school with their friends. Thank you to the Food Service's Staff for all our great lunches. Our teachers and aides monitor the students during the various lunch hours. Parents are always welcome to enjoy lunch with their child. Talk with your child's teacher or the office for more details. 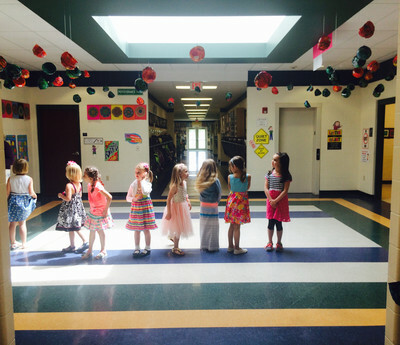 Turn left to enter the 4K and 5K Hallway, where the learning is always new and exciting! Make sure to take a look on the walls for all our projects. We are very proud of our skills! Students take a break from learning and enjoy playing on the playground. 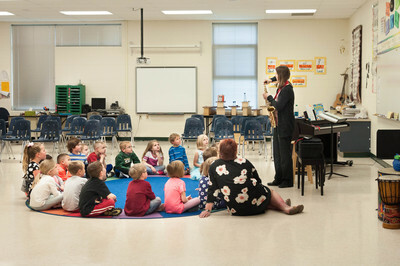 This is the primary playground for students in Kindergarten through Second Grade. The students enjoy playing in the sandbox, running around, playing hopscotch, and jumping rope. Students take a break from learning and enjoy playing outside. The students have the opportunity to play sports on the grass area. 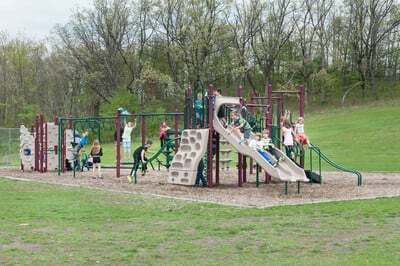 The intermediate grades enjoy playing on this larger playground, with monkey bars, balancing discs, etc. The students, also, have the opportunity to play basketball and kickball on the blacktop area. Mrs. Merklein, our P.E. 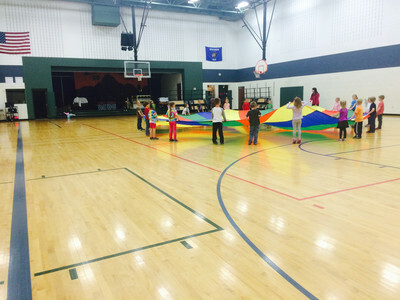 teacher, helps the students learn how to stay healthy and active each day. Mrs. Steedman, our music teacher, works with the students on their singing and creates an amazing Holiday Program and 5th Grade Spring Musical.